Turn on the VM, and open a console of the VM. When turn on the VM, after a while, “Press Ctrl-C for Boot Menu” message will be shown. Press Ctrl-C, wait until the boot menu is displayed. ******************************* * * * Press Ctrl-C for Boot Menu. * * * ******************************* ^C Boot Menu will be available. After a moment, boot menu will be displayed. Select the fourth item – “Clean configuration and initialize all disks”. Display the confirmation message, input “y” and push Enter key. After a while, rebooting messages will be displayed as follow. Rebooting to finish wipe config request. Waiting for PIDS: 1102. Skipped backing up /var file system to CF. Terminated . After a while, node setup will be started automatically. System initialization has completed successfully. Welcome to node setup. You can enter following commands at any time: “help” or “?” – if you want to have a question clarified, “back” – if you want to change previously answered questions, and “exit” or “quit” – if you want to quit the setup wizard. Any changes you made before quoting will be saved. To accept a default or omit a question, do not enter a value. This system will sent event messages and weekly reports to NetApp Technical Support. To disable this feature, enter “auto support modify -support disable” within 24 hours. Enabling AutoSupport can significantly speed problem determination and resolution should a problem occur on your system. For further information on AutoSupport, see: http://support.netapp.com/autosupport/ Type yes to confirm and continue (yes): yes Enter the node management interface port [e0c]: e0c Enter the node management IP address: 10.0.0.140 Enter the node management interface netmask: 255.255.255.0 Enter the node management interface default gateway: 10.0.0.1 A node management interface on port e0c with IP address 10.0.0.140 has been created. This node has its management address assigned and is ready for cluster setup. Start up the cluster setup wizard. ::> cluster setup Welcome to the cluster setup wizard. Initially, enter the basic parameters of cluster setup wizard. Step 1 of 5: Create a Cluster. Note: In this example, used “cluster01″ as the cluster name. Step 1 of 5: Create a Cluster You can type “back”, “exit”, or “help” at any question. Enter the cluster name: cluster01 Enter the cluster base license key: <license key> Creating cluster cluster01 Starting cluster support services . Cluster cluster01 has been created. Step 2 of 5: Add Features License Keys. In this time, skip this step and do later. Step 3 of 5: Set up a server (aka Storage VM) for cluster administration. Step 3 of 5: Set Up a Vserver for Cluster Administration You can type “back”, “exit”, or “help” at any question. Enter the cluster management interface port [e0d]: e0d Enter the cluster management interface IP address: 10.0.0.145 Enter the cluster management interface netmask: 255.255.255.0 Enter the cluster management interface default gateway [10.0.0.1]: 10.0.0.1 A cluster management interface on port e0d with IP address 10.0.0.145 has been created. You can use this address to connect to and manage the cluster. Enter the DNS domain name: testdomain.local Enter the name server IP address: 10.0.0.110 DNS lookup for the admin Vserver will use the testdomain.local domain. 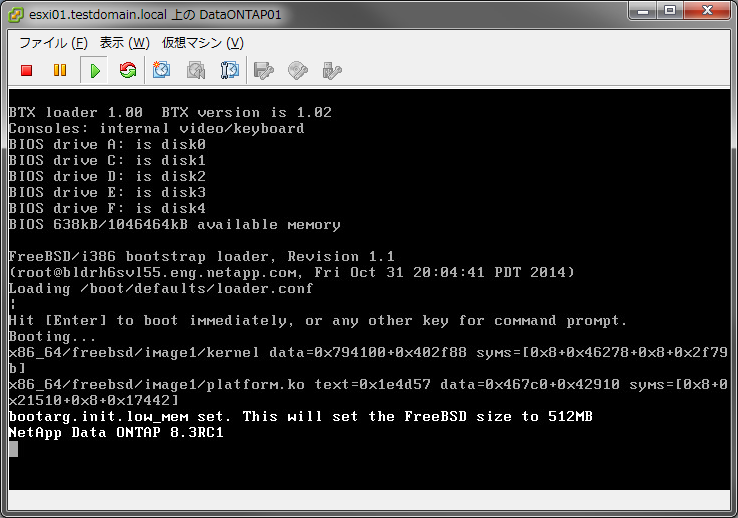 This step is skipped automatically because Data ONTAP simulator is a non-HA system. Step 4 of 5: Configure Storage Failover (SFO) You can type “back”, “exit”, or “help” at any question. SFO will no be enabled on a non-HA system. Step 5 of 5: Set up the node. Entering the node management interface parameters can be skipped because these parameters have already been entered. Note: In this example, used “lab” as the controller location. Step 5 of 5: Set up the Node You can type “back”, “exit”, or “help” at any question. Where is the controller located : lab Enter the node management interface port [e0c]: ↵ Enter the node management interface IP address [10.0.0.140]: ↵ Enter the node management interface netmask [255.255.255.0]: ↵ Enter the node management interface default gateway [10.0.0.1]: ↵ The node management interface has been modified to use port e0c with IP address 10.0.0.140 This system will sent event messages and weekly reports to NetApp Technical Support. To disable this feature, enter “auto support modify -support disable” within 24 hours. Enabling AutoSupport can significantly speed problem determination and resolution should a problem occur on your system. For further information on AutoSupport, see: http://support.netapp.com/autosupport/ Press enter to continue: ↵ Cluster “cluster01″ has been created. Check the cluster status after the setup wizard. Check the cluster status by cluster show.